In the world of mobile, the holy grail for manufacturers is a completely airtight top-down business model. In theory this is simple to achieve: create your own app store and operating system, get these onto a handful of top-notch devices and you're laughing. Actually pulling this off is exceptionally difficult, of course. At the beginning of the smartphone era it was a prize that seemingly any company could claim; since then most have failed, some have triumphed while others have barely survived, and Jolla – which translates from its native Finnish as 'dinghy' – falls into the latter camp. Founded in the fallout following the protracted death of Nokia's Services and Devices division, Jolla has clung to life through sheer bloody-mindedness. While other, bigger, richer firms have fallen, it seems the Jolla dinghy is almost impossible to sink. It was in 2013 that Jolla first came to life, gathering the dying embers of MeeGo, Nokia's last attempt at building an in-house operating system, and reviving them in a new platform dubbed Sailfish OS. Sami Pienimakki, co-founder of the Finnish startup, still has a great deal of passion for MeeGo, along with many others at Jolla, with the team including a number of former engineers who worked on the ill-fated Nokia platform. Sailfish is based on the underlying code behind MeeGo, with a new user interface that has been designed to make heavy use of gestures. However, while Jolla is proud of what it's created in Sailfish OS, there's a palpable sense that what exists is still a little half-baked. Since its inception, Jolla has been defined by astronomical ambition, despite having fewer than 200 employees. Its goal has always been to exploit the gaps that exist in Android, such as the perceived lack of security features, and offer an enhanced user experience. "The number one competitor for us has always been Android. Of course the other major OSs also belong on the list," Pienimakki told TechRadar before touching on the unique selling point of Sailfish. "[It is] a true independent mobile OS, offering the world a real choice in the flat/homogeneous mobile OS market." During its brief lifetime, there has in some quarters been a perception that Jolla lacks a strategy. A goal has always existed, as has a product and a dream; however the road to that end point has been littered with errors and hiccups. Take the initial dream: using the innards of MeeGo to craft a new operating system with state-of-the-art gesture inputs, a beautiful aesthetic and lots of new ideas. Sailfish had strong foundations, but scaling it and turning a solid start into a viable and profitable product has proved beyond the plucky startup. The Jolla Phone, released in 2013, was the first official device to come with Sailfish OS inside. Chunky and distinctive, it had a certain je ne sais quois that many other devices of the time lacked. Despite some fleeting success in its homeland, however, the phone failed to catch on elsewhere – and Jolla's troubles had only just begun. Announced as "the world's first crowd-sourced tablet" in late 2014, the Jolla Tablet certainly looked the part. It promised a pin-sharp 2048 x 1536, 7-inch screen, a quad-core 64-bit Intel chipset, and a whole lot more – and people were enticed. The tablet was a huge crowdfunding success, raising a staggering $2,571,262 – 479% of the original target. Understandably, Jolla was overjoyed. What followed, however, was a litany of unfulfilled promises. Initial delays led to months of waiting for backers, with reports of manufacturer disputes among other issues. In the end, only a few hundred tablets were shipped, far fewer than the thousands expected. Jolla admitted defeat, and a large-scale refund program was initiated – and the official take on the affair seems to be that it served as a valuable learning opportunity for the company, at least according to Pienimakki. "The Jolla Tablet project was a great learning for us, and it also is a perfect device for Sailfish OS," he says. "For small startups such as Jolla, it typically takes years to find the right strategy and focus points, and the Jolla Tablet project was one stepping stone we had to take on the way to a clearer licensing business strategy." Faced with poor sales and flagging finances, Jolla rethought its whole business model. The Jolla phone was allowed to live on, but was treated as a collector's item. Meanwhile the real focus moved from hardware sales to software licensing, a move with very tangible consequences. As advertisers jostle for precious smartphone screen time, could we be looking at a future of free phones and zero monthly payments? Jolla set out to conquer the world. Offices were opened in Hong Kong, and partnerships were struck in sub-Saharan Africa, India, South America and elsewhere. The company sought out small manufacturers who could come up with a device that would use Jolla's software in a new way, and put both parties on the map, as Pienimakki explains. "Jolla's perfect partners are typically pioneers in their own field, the ones who want to break out from the norm, and offer something extraordinary for their customers." As time went by however, these devices failed to materialise, and Jolla's digital dreams became nothing but vapourware. Indeed, it was only in 2016 that the first non-Jolla branded device bearing Sailfish OS appeared: the Intex Aqua Fish. So how then, in spite of these failures and setbacks, has this tiny player on the periphery of the northern hemisphere – and on the periphery of the mobile market – survived? Nostalgia and sentiment certainly play a part, though to say this is something of a slight to the thousands who have chosen to follow Jolla religiously. Why do they follow? The answer is simple: hope. Hope sold thousands of Jolla tablets and hope had enthusiastic venture capitalists pump funds in during the lean times. Consequences always follow hope, but Jolla still entertains a huge community. It’s a disparate group from open-source enthusiasts and former Nokia geeks to those seeking something different from the norm and amateur developers. One group even went so far as to develop a 3D-printed keyboard cover for the firm's smartphone. Understandably, Jolla has chosen to focus on this community, a lifeline in stormy seas. Every new build of the operating system is crowd-tested, and Jolla engages enthusiastically with everyone who gets involved. This crowd-testing approach has its benefits, but also its limitations, stimulating involvement but at the same time stifling innovation. Nonetheless, the firm has also chosen to test its hardware on the public. "Our developer and fan community has always been in the core of our ways of working," Pienimakki told us. "A few months back we launched a specific Sailfish Community Device Program, which included the latest Jolla smartphone, the 'Jolla C – Limited Community Edition' and other activities, such as community events and developer support sessions." 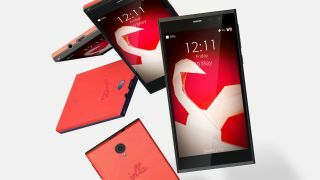 The Jolla C is the latest device to be released by the firm, and it's unusual in a number of ways. First, it isn't designed and produced by Jolla, as the Jolla Phone was, instead being a rebranded Intex Aqua Fish. Second, it's sold as a developer-only model, produced in brief batches of a few hundred or so, and sold in flash sales. Stock is allowed to deplete completely, which has a number of benefits, not least in there being no need to maintain an official customer support base for the phone, as it's only intended to be used as a support device for those developing for Sailfish. Although the feeling at Jolla seems to be upbeat, even combative, it's difficult to share in the enthusiasm. Of the original founders, many (including poster-boy Marc Dillon) have left, along with dozens of employees laid off after the decision to cut the hardware department. We haven't seen the last of this intrepid little dinghy. Business partnerships have failed to provide any fruit, and funding is drying up. In December 2015 Jolla secured roughly $12 million in rescue funds to stay afloat, but the issue remains: what next? Caught between the rock of iOS and the hard place of Android, what practical options are available for expansion? On this subject Pienimakki clearly likes to keep his cards close to his chest. "We currently have several licensing customers with whom we are working," he says. "These will be announced later." So while there are no guarantees of success, and plenty of opportunity for failure, it seems that this most determined of mobile industry survivors will be with us for a while yet. We haven't seen the last of this intrepid little dinghy.